With over 20 years as a professional designer and over 12 years as a design leader, I have a diverse background across entertainment & media, online communities, fintech, and design agencies. Through my work as an individual contributor, along with my work as a design leader, I’ve grown companies and teams, built compelling products, and defined amazing brands. I believe in strong processes and transparency, an inclusive design culture, in user empathy and research, and in a customer-first approach to all design. In other words, design always starts with the customer, and the technology works backwards from there. As a designer, I pride myself on my attention to detail, and I’m very much driven by craftsmanship. But I’m also practical, and believe that the best solution is usually the simplest one. Design, after all, is about communication and solving problems, and adding complexity is rarely good for clarity. As a leader, I pride myself on the positive work environments I nurture, and the excellent teams I build. There’s a lot of power in designing an environment where design can flourish, after all—for both designers and businesses. When designers have room to explore new ideas and push boundaries, it’s been proven that businesses benefit. When I joined Chime it was with the intention of challenging myself and learning how to navigate a new tech vertical (finance). Fintech, as it’s called, is markedly different from most other verticals I have previously worked within (media, entertainment, social networks, etc). What attracted me to working with Chime in particular, as opposed to the many other fintechs in the Bay Area, was its mission: to better the financial health of its members. While that may not sound revolutionary, after taking a deeper look into Chime vs. any other bank or fintech you will learn that Chime’s demographic is predominantly lower-income, paycheck-to-paycheck, and struggling. Other banks and fintechs care more about wealth management, investing, etc—all of which are valuable notions for people who aren’t struggling (people without “wealth” don’t really need their wealth managed, right?). So, in brief, my ethics really aligned with Chime’s. Upon joining the company, I quickly began hiring a design team to work across brand, product, and marketing design initiatives. I brought in a Head of User Research (Chuck Liu), a Lead Product Designer (Israel Sundseth), a Senior Product Designer (Mike Iseri), and a Senior Marketing Designer (Ashley Seo). These four new hires augmented the existing team of a Product Designer (Jacob Hartog) and a Junior Marketing Designer (Iching Cheng). Joining Chime was effectively like starting from ground zero. While Chime did have an existing app (which arguably was already very successful), it had no formal design process, no design system, and really no sense of how a true design “org” would fit into things. Together, we began collecting all of our existing assets into an organized shared drive system, formalized our file storage process, and built out a design system based on the existing app work (so that we could build upon it as we improved the design sensibilities of product and marketing). Operational guidelines were created in Confluence, to ensure all designers shared a similar process. We also formalized our schedule, setting up weekly syncs between design, product, and marketing teams, setting up our critique cadence, and setting up a weekly triage to maintain the tickets coming into our team kanban. These meetings allowed for face-time, transparency, and a shared sense of prioritization. Looking now at the design work itself, Chime was living in a very unfriendly, stark, emotionless space. Knowing that finances are a source of stress, one of our first design initiatives was to find ways to make using Chime slightly warmer and friendlier. We accomplished this by drawing new illustrations, more readable/accessible iconography, and changing our font family from Source Sans Pro (a really technical-looking, hard-to-read font) to native fonts San Francisco and Roboto (for iOS and Android platforms, respectively). We also modified our color palette, became more mindful of how we treat white space, and altogether took a product which had previously had no personality to something that now feels welcoming and easer-to-use. The Chime Design System was built using Invision Design System Manager. Through efforts in growth, marketing, and product, and a focus on continuous experimentation, we grew our audience from about 900k accounts to over 1.8M. We re-thought our card mailer to be more on-brand and guide recipients towards core goals: activate the card and sign up for direct deposit. Joined Chime in early 2018 as Head of Design. Founded new design organization and grew team in product, research, and marketing. Led efforts to establish a design system and push visual sensibilities to be simpler and friendlier. Through growth and marketing experiments, more than doubled accounts from 900k in March 2018 to 1.8M in October 2018, opening at a rate of 150,000 new accounts per month (as much as Wells Fargo). A vision of the future of Chime. Simple, bold type paired with clearer iconography. New, softer modals paired with friendly images take the stress out of finance. Replacing hairline nav icons with clearer, bolder icons for accessibility. Friendly illustrations make money management a more welcoming idea. Exploring how to help people save better using goals. An expansion of the icon family: thicker line weights and uniform radii. As we began thinking about expanding our product offering, it was important to consider how all physical cards play together in a brand family. Truthfully, I joined Ellation so I could work on VRV. Having learned about the core premise (a subscription-video-on-demand, or SVOD, targeted to a niche, nerdy audience) I was excited to contribute in whatever way I could. Once I was officially on board as an employee, I soon learned that there was a pressing launch schedule by which the business hoped to have VRV out the door: April of 2016 (I joined in February). After a handful of conversations with my newly-minted colleagues, I also learned that this launch date was in no way feasible. 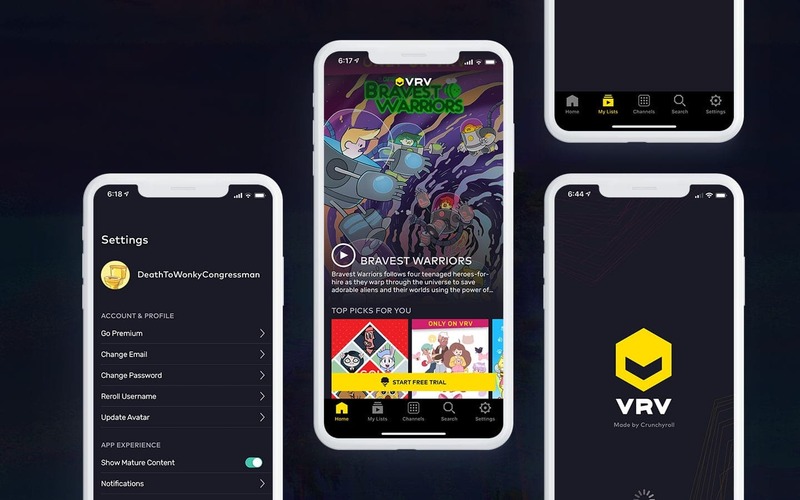 VRV was intended, at launch, to be on iOS (mobile-only), Android (mobile-only), web, Roku, PS4, and XBOX One, with a mostly-custom CMS alongside all of that. Were Ellation to have had enough staff (either in-house or remote) to manage the design and engineering of all of these products, the timeline may have been more realistic. However, the staff was overall rather thin, with some people trying to own multiple platforms. Furthermore, there was still no real marketing plan in place, and the VRV brand had not been fleshed out. 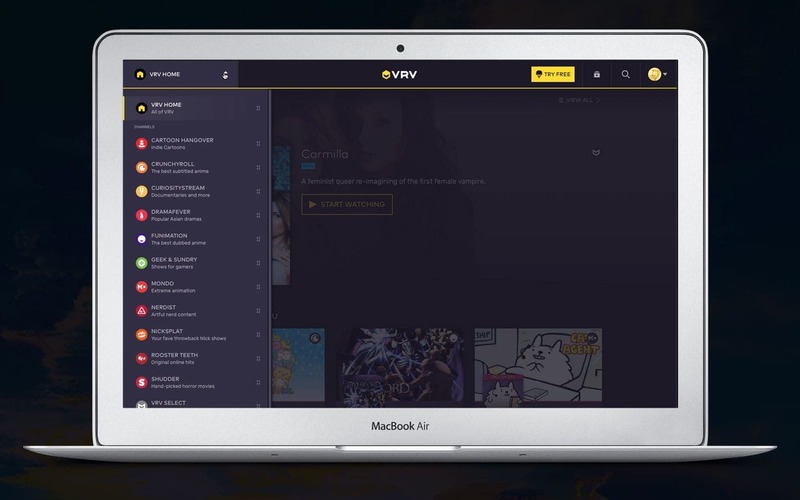 Beyond a streaming platform for nerds/geeks, what was VRV supposed to be? Everybody had different answers. In short order, my first duties were to help define the brand of VRV (so we knew what we were making), begin defining a shared design vision across all platform products (so each app looked like it came from the same place), and setup some fundamental design processes (so we could work in a shared rhythm). I hired Cindy Kim to lead our user research efforts, so we could actually get a sense for who we are building products for, what is/is not working with our products, and ultimately de-risk our upcoming launches (by way of eliminating wasted engineering effort through research and validation). Together, Cindy and I worked to setup a user research program at Ellation, generating new user archetypes, a user journey map, a dedicated testing lab, and a cadence for on-site user testing sessions. We also innovated a guerrilla testing program, traveling to conventions and events around the US where our demographic was known to be and asking attendees to use prototypes and/or live apps (allowing us to get critical user feedback on our own timeline, rather than waiting for users to opt-in to an online program). User research helped us narrow in on our archetypes early on, changing our product strategy. I worked with Ace St. Germain and Arlan Smith to define the VRV brand, pulling in stakeholders from marketing and business as needed to ensure we were on the right track. We also brought in the contract talents of Nick Sirotich to help us with illustrations, and Morgan Isaacs to help us with textural motion graphics. Ultimately we completed a large set of illustrations and avatars for VRV, along with a handful of textural motion pieces to use in promotional images, and also produced a Phase One Brand Book which helped the whole company get on board with a shared vision for our fledgling product. As we grew, we also re-thought our archetypes based on new data acquired through qualitative means. Within Product Design, I took stake of where our apps were. 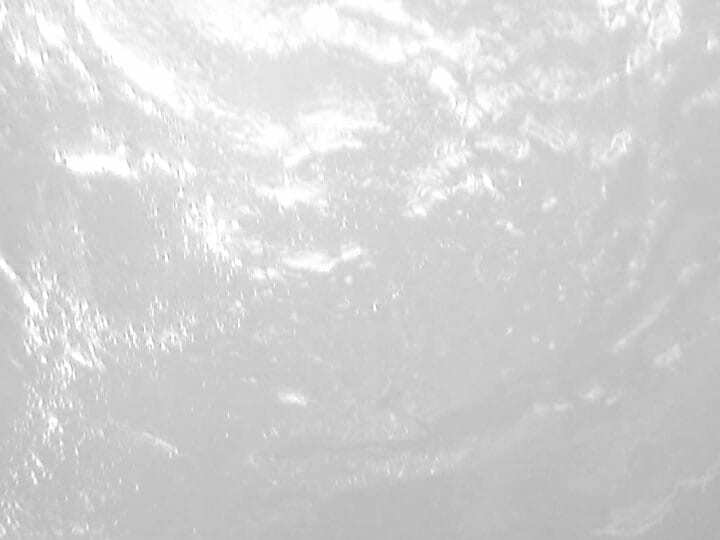 Mostly, they were disconnected from one another. Every app seemed to be using a different set of colors, different fonts, different iconography, and different hierarchy. They didn’t look like they came from the same company. Rather, they looked like they had come from individual designers who had been aggressively working to meet an unrealistic schedule (which is exactly what had been happening). So, as a product design team (Nan Chu, Israel Sundseth, Sean Reynolds, and Jane Ross), we got together and began making some shared design decisions: we chose two fonts (Mark Pro for headlines, Rubik for body copy) and spread them across every platform, we chose a color palette, and began drawing iconography. Within a few weeks our apps began looking like they belonged together. It’s funny how a shared foundation can create unity, right? After a short while, the timeline was pushed back to November 2016. Still an aggressive schedule, but at least more tenable. And, ultimately, we made that timeline happen, launching VRV across all our intended platforms. Unfortunately, our web experience was rather...sad. On web, we were only able to accomplish a subscription management dashboard. Users did not have the ability to watch content. We needed to rectify that. An early version of VRV for PS4. It was...pretty broken. A segment of our pain points charting, trying to understand how VRV was perceived after launch and how to rectify its problems. Around the same time, I brought on an additional Product Designer (Kyle Crumrine) who took ownership of our web product for VRV, helping to drive that product towards a “real” SVOD launch early in 2017. Coincidentally, web ended up becoming our most widely-used platform for VRV. Over the course of the next year, a lot of growth within Ellation occurred, spurred on by VRV. The Product Design team, which I was fortunate enough to lead, grew to 15 total staff spread across two continents (bringing on the talents of Kaylin Kudla, Robin Fox, Mao Kue, Marcel Sendrea, Vladimir Hadjioglo, Ramona Zeimann, Victor Turculet, Vladislav Ucrainschi, Victor Turculet, and Cristian Plop). Together, we were able to refine and expand upon our products, launching revised experiences for iOS Mobile, Android Mobile, Web, Roku, Playstation 4, and Xbox One, and then launching brand new experiences on iOS Tablet, Android Tablet, and Apple TV. Me with some of the design team from our Eastern European office. Additionally, with the help of the larger team, we were able to dedicate more resources to critical, foundational elements of product design such as building out a design system for every platform, refining our shared components libraries, and beginning to contribute to front end code here and there. Joined Ellation in 2016 to build VRV, a multi-channel, niche-audience streaming service. Launched VRV on a myriad of platforms: iOS, Android, Tablets, Apple TV, Roku, Playstation 4, XBONE, AndroidTV, and FireTV. Also contributed to brand bible and helped define brand personality. Unique illustrations help clarify the personality of VRV: irreverent, ridiculous, and fun. VRV’s design ethos: combine simple, accessible layouts with bold type and imagery, with a nod to video game culture. VRV’s grid system remains consistent and basic, driven by shared card components. An example of VRV’s card components, which all share common elements even at different scales. A sample of the icon family created for VRV. A nod to video game culture mixed with clear, chunky illustration. VRV’s Apple TV app utilized common patterns mixed with a bit of VRV flair. The best way to clarify VRV’s channel offerings on Apple TV was a grid system. More screens from VRV’s Apple TV app. We also built a robust web experience where most of our viewership ended up happening. Select samples of the design system created for VRV. Here you see typography, button styles, and input fields being defined. Sample of the Apple TV Design System. Here you can see our focus on content tagging, which was a critical feature for content discovery. Sample of the design system for mobile (iOS). Here you see how we define key art treatments, banners and ribbons, and even avatar sizes. For those not in-the-know, Crunchyroll is the world’s largest streaming platform for anime. When I describe it to people who’ve never heard of it, I call it “Netflix for Anime,” and then it clicks (assuming they know what anime is). In 2018, Crunchyroll was given the prestige of being one of the 100 Websites That Shaped the Internet as We Know It (by Gizmodo). This reflects just how impactful the service has been for fans of anime. Knowing this, when I joined Ellation in 2016 I was not only there to launch VRV but was also there to contribute to Crunchyroll’s growth and continue to nurture its passionate fandom. One of my first Crunchyroll-specific initiatives was to better understand its audience. In my view, it’s impossible to design great experiences for an audience unless you can empathize with them and truly comprehend how they think. While I am not as passionate about anime as many of Crunchyroll’s fans are, I was fortunate to have spent a considerable time at Deviantart, where anime was always quite popular. However, that familiarity isn’t enough to actually build competent products. Fortunately, just prior to joining Ellation, there had been some outsourced user research which was comprised of in-home visits and interviews (complete with video). Cindy Kim (my newly-hired user researcher) and I watched all of the accompanying videos, read the notes, and began to formulate new archetypes for Crunchyroll’s demographic. As a group we dug deep into the brand experience of Crunchyroll today, and what it could be in the future. It’s worth noting here that Crunchyroll and VRV did end up having some archetype overlap, but they were not perfect reflections of one another, requiring us to build and maintain two separate archetype documents and user journey maps. Additionally, over time we were able to collaborate more directly with our in-house data team and our heads of brand for Crunchyroll, which contributed to further refinement of Crunchyroll’s user archetypes. Crunchyroll celebrated its 10-year anniversary, which coincided with reaching its 1-millionth subscriber. 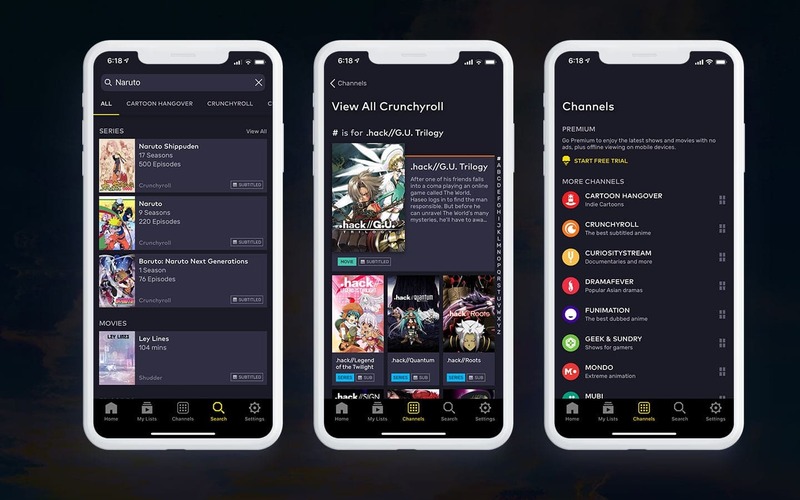 Given this better understanding of Crunchyroll’s demographics, I worked closely with Sean Reynolds and Israel Sundseth to design and launch a refined experience for iOS, alongside a brand new app for Apple TV, as well as new apps for Android TV and Amazon Fire TV. Additionally, we iterated on Crunchyroll’s sign-up funnel to optimize subscription signups for both Crunchyroll and VRV. My co-workers thought I was a pretty cool dude, and so I got this. Ultimately, the best part about Crunchyroll was the people and the fandom we were serving. It’s rare to be given the opportunity to work with passionate, fun, talented people who also love the audience they're building for. Crunchyroll (well, Ellation) was one of those places for me. Crunchyroll is the world’s largest anime streaming service. Through a multitude of efforts, encompassing changes to products and growth experiments, we pushed Crunchyroll’s subscriber number to well over 1M. Primarily, my goal as Director of Product Design was to maintain and build upon Crunchyroll’s rich brand. The updated Crunchyroll iOS app increased subscription conversions by over 300%. Simpler navigation paired with fun icons for the myriad of categories available on Crunchyroll. A Night Mode theme for use in the evenings (or any time). Crunchyroll’s Apple TV app brought the brand’s sensibilities to the big screen. 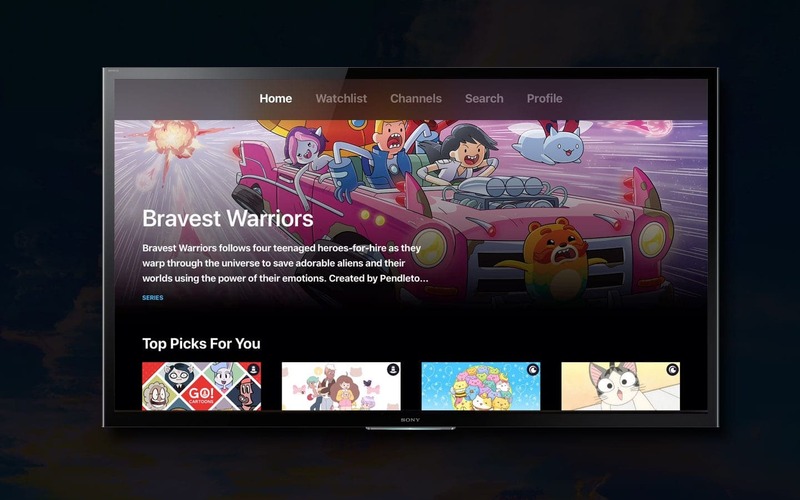 Use of familiar patterns helped the Crunchyroll Apple TV app gain quick adoption. 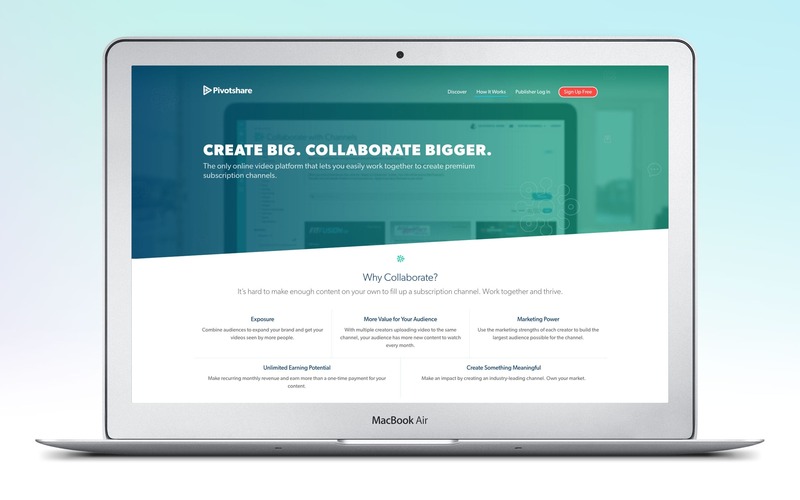 Pivotshare is a robust platform that allows creatives to build their own SVOD and VOD channels + collaborate with other channels, quickly and easily. I helped define the brand and product strategy, as well as design all aspects of products. Contributed to front-end code for web using JS and Ember. One of my first duties was designing the logo and defining the brand. Along with the primary brand, my responsibilities also included defining sub-brands, represented as self-owned SVOD websites distributing video content around football, religion, and food (among many others). 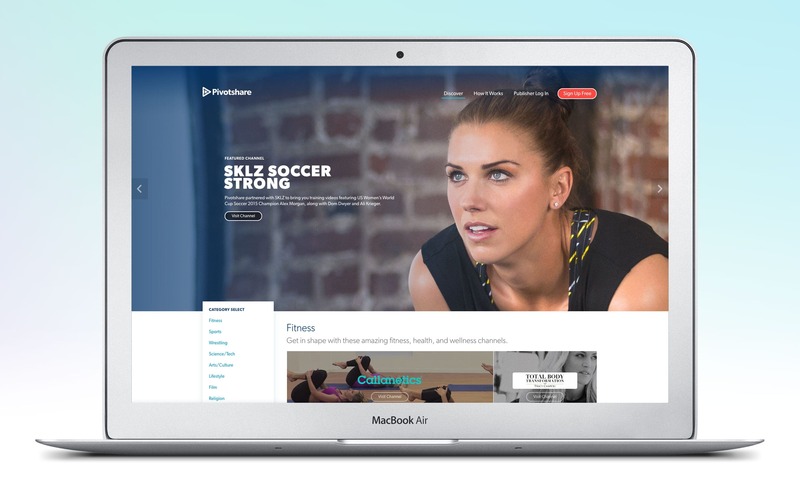 The homepage of Pivotshare defined the brand along with a well-segmented collection of must-know information. The discovery section allowed visitors, along with potential content partners, to browse through a curated catalog of hosted sites. The "how-to" section explained how Network Publishing, Pivotshare’s patented revenue-sharing system, worked. 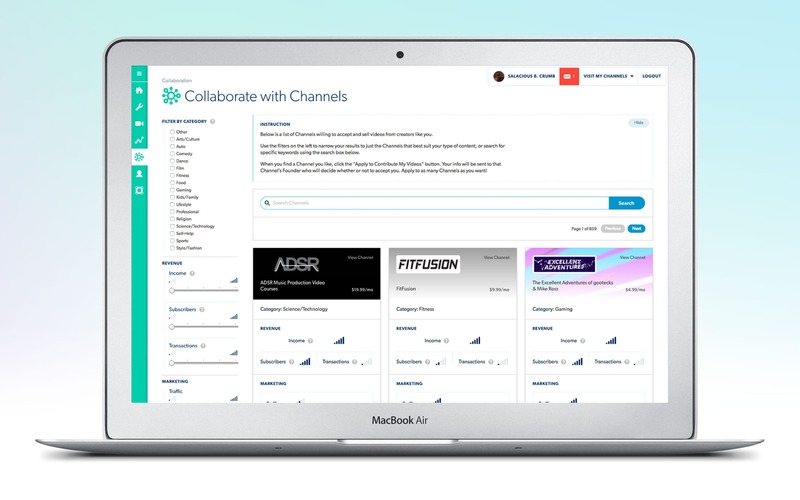 The CMS allowed publishing partners to manage every aspect of their channel, from how it looks to uploading new videos. Custom business cards in the shape of a traditional ticket stub with a high-gloss spot varnish applied. Deviantart was one of the earliest social networks on the web. Founded in 2000, it’s been called one of the 100 websites that shaped the internet as we know it. I joined full-time as Creative Director in 2008, building up a design team that managed brand, product design, and marketing design. Prior to being a full-time employee, I was a long-time community member. I personally redesigned the logo which, even after subsequent rebrands, remains iconic. We redesigned Fella, the site’s mascot, to show more personality and life. The new form factor (now with hands) also allowed us to guide users towards specific on-screen goals or actions. As part of our extended collateral we transformed the brand into many familiar, but contextually-appropriate, executions. This slightly more rustic-looking application is one such example. To foster a united brand, we created logos for various teams, internal tools, and features. Throughout, we adopted a more visually-robust sensibility to reflect the high creativity in our community. The design team also created unique apparel for our retail arm, which for a time was one of the more lucrative departments within the company. Some select shots from our Brag Book, which was designed to deliver to potential promotional partners. To celebrate the 10th anniversary, we designed special gold-foil invitations to a special party in Hollywood. I was also able to act as an illustrator once in a while, designing these tongue-in-cheek posters for one of the site’s infamous April Fool’s Day promotions. Throughout my tenure, we collaborated with huge brands like Sony, Dr. Pepper, and more. In this example, we designed and built a contest to promote Gears of War 3. Exploratory branding designs to unite the employee experience with the retail experience, and beyond. Exploratory retail packaging designs for a vinyl paint-it-yourself llama. Remember that 10th anniversary party? Well we had a llama there. Copyright 2019 Ryan Ford unless otherwise noted. All Rights Reserved. Design and most code by Ryan Ford. Open source library credits in the console.